It may not be the most versatile of combos, but with some of the better-known boutique Deluxe replicas selling for over three times as much, the Blue Blood is a bargain. Well priced. Loud and ballsy. We're in the middle of a vintage amp revival at the moment, and you don't get more vintage than the 1950s Fender tweed models. But original tweeds fetch crazy money, regardless of condition. If reliability and price are more important, why not check out one of the very affordable 'clone' amps made by Juketone, such as this Blue Blood combo. Based on the classic 5E3 'narrow panel' Fender Deluxe made between 1955 and '60, the Blue Blood is fairly faithful to the original, with a 5AR4rectifier instead of the original 5Y3 helping to produce a couple of extra watts, and a higher-gain 12AX7 preamp valve instead of the 12AY7 for easier overdrive. The chrome steel chassis encloses a hand-wired circuit based on a PCB with extra wide holes that follows the original eyelet board layout, with a couple of modern additions. It's a neat compromise that should be just as reliable as an eyelet board. The components are decent quality, with low-noise metal film resistors, orange drop-style capacitors and smooth-action pots. The wiring and soldering are generally very neat; overall, it's a better-than-average build quality for a Chinese-made product and should last for ages. The 5E3 Deluxe circuit is deceptively simple, with two pairs of input sockets labelled 'normal' and 'bright' feeding separate volume controls, and a simple treble-cut tone control. The clever bit is that both channels are active all the time, so you can cross link them with a short patch lead and balance the fatter normal channel against the bright channel for the perfect mix. The Blue Blood fires up with very little hum or hiss. The tone is clean up to around halfway on the volume controls, but after that the characteristic bark and bite of a tweed Deluxe begins to take over, with almost total saturation once the volume knobs are maxed out. Think early ZZ Top, Joe Walsh, Derek And The Dominoes: that's the tweed Deluxe. There's a good reason it's one of the most popular recording amps of all time. For us, there could be a little more difference in colour between the Blue Blood's Normal and Bright channels. The Juketone doesn't quite get the complexity of a real tweed, or some of the more exotic clones, but it makes up for that in power, mostly thanks to a very efficient Celestion Vintage 30 loudspeaker - it's easily loud enough for live gigs as long as you don't want perfectly clean rhythm sounds. 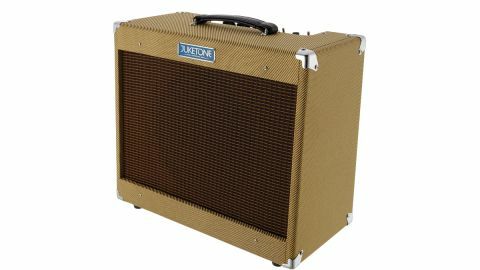 All things being equal, the Juketone Blue Blood is an excellent buy if you're after tweed tone on a budget. It's loud, ballsy and built well enough to take the knocks of non-stop gigging, while Chinese production and direct sales add up to a very competitive price.